Source of information. Great job. 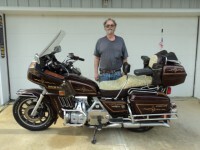 I have an 81 Honda goldwing interstate 1100. I am having gas cap issues not allowing fuel to flow. I have read the "replacing the fuel pump "thread and saw that the new Honda gas cap # is 17660-463-505. Unfortunately the cap is no longer available. Does anyone know if there is another Honda gas cap that will work? Thanks. Soak your cap in a white vinegar over night. or take the cap to NAPA. Your gas cap has an air vent hole, using compressed air blow it out. In an emergency don't tighten it down.